Something has leaked and now you need to repair water damaged drywall. What went wrong? Did the toilet overflow? Is your roof leaking? Before you worry about the drywall, you need to figure out what happened and fix that problem. Not sure if this is your problem? See the articles 'How To Patch Drywall' and 'Drywall Repair' for a listing of related topics along with solutions for problems. Work backwards from the leak. What is above it? Remember that water runs down hill, so the damaged drywall is below the problem. Do you have a bathroom above the spot. You have a lot of water that runs through a bathroom. Is something clogged? Is something leaking? Once you have dealt with the leak you can attend to your drywall problem. To repair water damaged drywall may not be that hard. Sometimes it is just a stain. Don't make the mistake of thinking that a coat of paint will solve it. Actually, paint may solve the problem, but it needs to be the right kind of paint. Drywall that has been exposed to repeated or severe water intrusion will most likely need to be replaced. Are you a strong person? You can deal with this. It's only drywall, how hard could it be? A contractor will charge you for the amount of work involved to repair water damaged drywall. Best case you could have someone fix it in a single visit, around $50 to $75. Multiple visits will cost more spending $200 to $300 would not be unheard of. Could be more, drywall is considered a labor intensive trade. To repair water damaged drywall may require replacing drywall and taping. Both of these activities require some work. Hopefully, you will only have to paint with the right kind of paint. Where the drywall is still solid and dry. 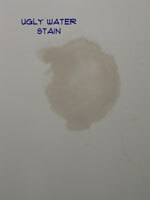 It is possible that you just need to repaint the stain with a good quality stain blocking paint. Don't use regular paint, water stains will bleed through. To repair water damaged drywall you may run into mold. Take precautions before you attempt to remove moldy drywall. Check out this government website before you mess with mold. A Brief Guide to Mold, Moisture, and Your Home, it will give you some insight and safety tips. Another good article is Mold, on the CDC website. Drywall patches that are poorly done can look just as bad as the problem you started with. Drywall is also messy, the white dust and drywall compound has an amazing ability to get everywhere. Use drop cloths and plastic to contain the damage path. Drywall is a layer of gypsum sandwiched between two sheets of paper. Too much water can cause the core of the drywall to break down and the paper to separate from the core. Remember that there is no point in fixing the drywall until you have repaired the water leak. Fixing 'Water Stains on Drywall' explains what to do when a leak stains the dryall. You will learn whether or not it is possible to paint over the spot. When the paper and core of the drywall become compromised, you are left with no other choice besides replacement. The article 'Replacing Water Damaged Drywall' gives you pointers and led you to the right information. When the water damage occurs on a ceiling you may have texture involved. Fixing 'Water Damaged Ceiling Texture' is covered in this article. Remember the steps? Follow them in order. Fix the leak first and then repair the water damaged drywall. You could have a fairly simple problem or you could have a bigger job to do. This depends on the severity of the water damage and how quickly it was fixed. We hope this project was not too difficult and that is was successful. Move on to other projects, or just get some rest.